Singer 9960 Quantum Stylist Review: Is it Worth the Hype? 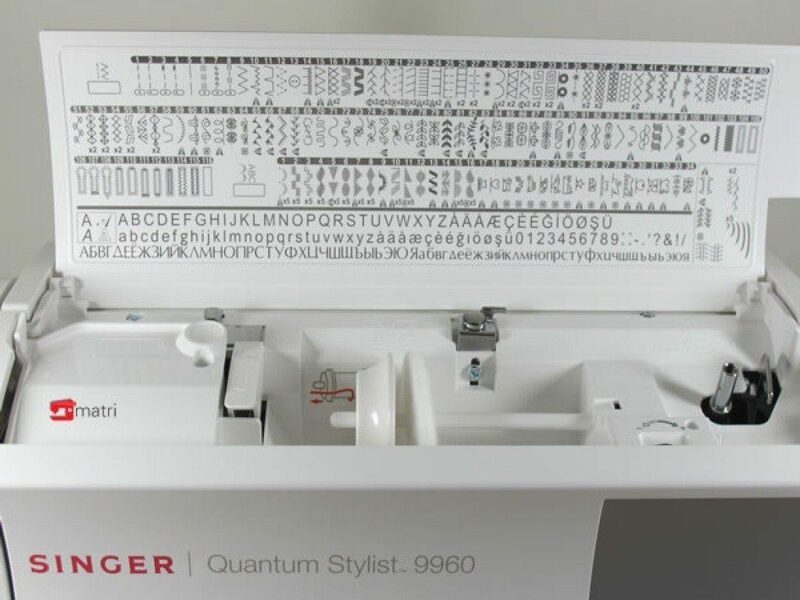 The Singer Quantum Stylist 9960 is one of the most popular computerized sewing machines on the market today. And the company now offers bonus accessories and a hardcover as well as an extension table with this model to sweeten the deal. I’m going to tell you immediately that this is a model I highly recommend to at-home sewers and quilters. During my Singer 9960 review, I’m going expand a little bit more on what I really like about this model. Yes, there are 600 stitches but this isn’t enough to persuade a true sewing enthusiast to buy this machine. 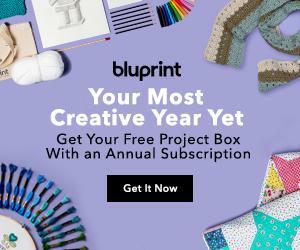 We all know that you won’t be using the vast majority of the stitches anyway, and that a real sewing machine has to offer more than just an abundance of stitches. S0, what does this sewing machine have to offer? It turns out… a lot. Let’s first start by looking at the features that are included with this model. As you know, the first step to sewing is to load up your thread and bobbin. This is done through the easy threading system, and there’s an automatic needle threader, which every sewing enthusiast will love. After all, how many times have you pricked your finger or sat there trying to thread your needle to no avail. Singer states that you can have your entire machine threaded in just six seconds. And I’m here to tell you that this is not a reality at first. I didn’t sit there counting the seconds, but it is a learning process and it will take you about a minute the first few times. What I do like about this machine is that there are printed instructions that show you how to thread the entire system with ease. These instructions are right on the machine itself, so even the first-time sewing hobbyist will be able to thread the machine quickly. Once I got the hang of it I was getting really close to the six second threading as advertised. Moving on to the bobbin system, the clear cover allows you to know the exact state of your bobbin and when you need to refill. This is a top drop-in system, so you simply drop it in, and you’re good to go. I was thoroughly impressed that it took just a few minutes to get everything up and running for my project. I should stop right here and mention that thread is self-cutting, so you don’t have to worry about grabbing your scissors and cutting the thread each and every time you’re finished. Simply let the machine do it for you – it’s super simple. There are so many different stitches that I can’t name them all. You’ll have all your basics, and 600 stitches in total. You may not use many of the stitches, but if you are a quilter or work on advanced projects, the lettering and decorative stitches are going to be very useful for you. You’ll be able to see, visually, which stitch you have chosen and even better, the advisor lets you know which presser foot to use for your desired stitch (18 are included for free). Tension is automatically controlled, and one of the absolute best features of this machine is the speed control. There is a speed lever that allows you to choose the maximum speed, and you can also choose to sew at a slow speed. What is this good for? Beginners that need to learn how to adequately control the speed of the machine, or for particular projects where you need to slow down your speeds to ensure the tension and tightness in the material is ideal. This is especially helpful when working with heavy duty fabrics like upholstery, where you can break the needle if you go too fast. Buttonholes are easily made, with 13 holes available for you to use. If you’re making your own patterns, there are programmable patterns right on the machine that can be edited or added. With a free arm, you’ll be able to easily hem items, and there is also an extra-large sewing area. The extension table allows you to quilt items with the utmost of ease, and is highly useful. I hate having to struggle with small working areas, and this really pushes this machine to a whole new level. If you need to adjust the pattern, there is also a needle up and down feature that will work perfectly for your needs. The interior frame is made of metal for the utmost in durability and stability. During my Singer 9960 review, I thought that the buttonholes could’ve been a little bit better. While the buttons did work, it seemed like the holes were just a little bit too small for the actual button size. You have to fiddle with them to get the button in initially, and eventually the hole will widen to your desired length. The Singer 9960 is a sewing machine that I would recommend to anyone that wants to upgrade their standard sewing machine. Not only is this model affordable, but it’s build and quality are outstanding for the price point. 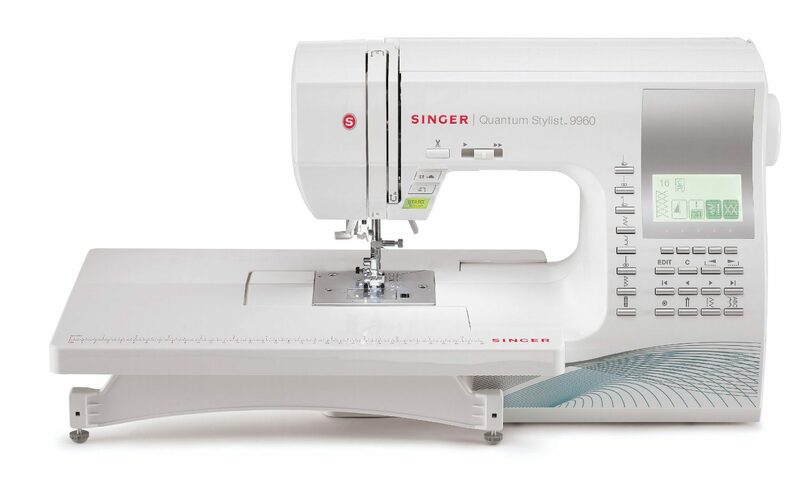 It also comes with features that are perfectly designed to make your sewing much easier and more efficient. I just purchased the stylist. It came with a walking foot which I was very excited about. It’s easy to attach but as far as I can tell the quilt guide does not work with the foot. This is essential for straight line quilting. Am I missing something? I bought this sewing machine when i was just about to retire. I love this sewing machine and it has many choices of stitches and wonderful sewing machine for quilting. I am very happy with my Singer 9960 Quantum Stylist. I have been sewing for about 67 years, on just about very type of machine. I am pretty computer savvy, but i have to read the instructions over and over, since this maching is unlike any other I have used. i have been wanting to learn quilting, so I am sure this machine will be just what i need. Singer has never let me down. I love this machine, I have had it for about 3 years and have made at least 10 queen size quilts on it. It works well for staight line quilting but I use it mostly for free motion. The only draw back I have is that the throat is not wide enough and on several occasions has caused a problem with getting the quilt thru, but if you make smaller quilts, it’s a breeze. I am so happy that I purchased this machine. Just the smiles I see on my family’s face when I Give them a quilt I’ve quilted myself gives me an added bonus. I recommend this machine to anyone who likes home sewing, oh I forgot I use it for making clothing and all the different stitches are great, especially when you want a little dazzle or make that same old outfit look quite different. I bought this sewing machine and love it for simple and decorative stitching. I am learning how to quilt, and am frustrated with free motion quilting right now. I have watched tutorials, and read the manual. When I free motion quilt after about 15-20 minutes into the project I break the thread. After the initial break, I continue to break the thread within a few minutes of starting up again. BUT!! If I turn the machine off and leave it for a bit I can free motion quilt again for 15-20 minutes again. Do you know what I am doing wrong to cause the thread to continue to break? In addition the needle will freeze and break the thread also.